RiskWatch products are Software as a Service, cloud-based solutions that are purchased right here on our website following the four simple steps below. Try our software free for 30 days. No payment information is required. Once the trial period is over, extend your use by purchasing licenses based on the number of users you will have. How Many Users? Pricing is based on how many user accounts you will have. At least one Administrator account is required. Each additional user requires an account. Survey Questions. Select question sets from our library of regulations and standards. Read about our content and learn how you can assess compliance to your own policies and standards below. Users and assets. Once user accounts and assets are created, you can create/begin assessments. Do a preliminary assessment to see where risk lies and then do detailed assessments on high-risk locations. Stage 1 - Relevant asset or scope data (Organizational information, Criticality, Consequence, Threat Level, & Evaluation Criterial) is identified and entered into the RiskWatch application. Stage 2 – Personnel that have the required knowledge of the organization’s processes, policies, and/or controls are identified and designated as Contacts in the application. Stage 3 – Surveys access is distributed by the application via email to the Contacts identified in Stage 2 to evaluate the processes, policies, and or controls in place. Stage 4 – Assessment is ready for analysis. Risk Scores are calculated based on Criticality, Consequence and Threat level from Stage 1 and a Gap Score based on the Survey results from Stage 3. Stage 5 - Gaps are identified based on the survey results in Stage 3. Stage 6 – Gap mitigation recommendations are given by the application Administrator. Stage 7 – Remediation Tasks based on the Administrator’s recommendations (and/or recommendations provided by the Contacts) are assigned by the Administrator and managed by the application. Stage 8 – Final Report is Generated by the application for review by Upper Management or Auditors. One of the most important components of a RiskWatch product is the assessment content, metrics, and criteria. You will need to select question sets from our content library based on what you are assessing. Is it regulatory or industry compliance, enterprise risk, or supplier risk? Do you want to assess your organization’s security profile to standardized best practices? Maybe you want to assess each department or business unit’s compliance to your organization’s policies? 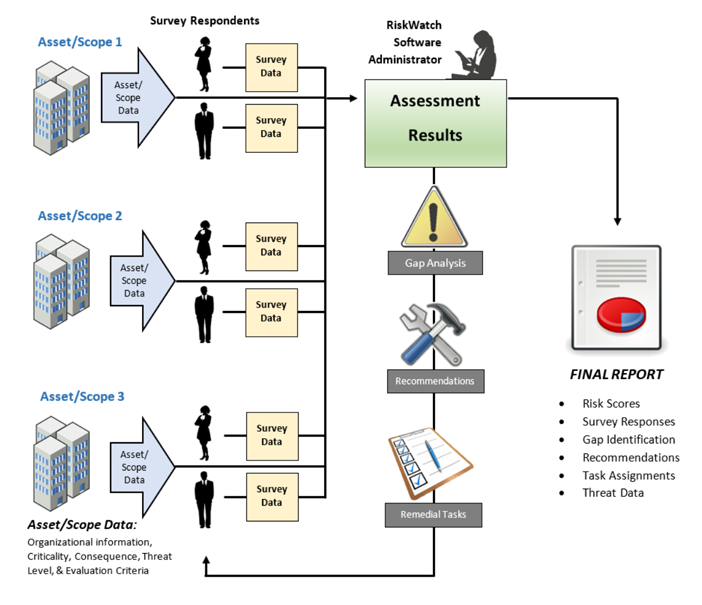 Each of these unique assessment types leverages survey questions from the RiskWatch content library. When you initiate your subscription, you will be asked to select the question sets that you will need to complete your assessments. Using the upload template, you can add questions to the survey module that currently do not exist in the software. These can be from government regulations, industry standards, best practices, or your own policies. These can be easily added using your product’s bulk upload process where you simply fill in the details of your assessment questions into a spreadsheet template that is generated by the software. Then upload the file back into your RiskWatch platform. Each question can be weighted so some can have a greater impact on your risk/compliance score than others. For example, your question asking if a facility has a perimeter fence may be weighted higher than your question asking if there is barbed wire at the top of the fence. Questions are also mapped to vulnerabilities allowing you to determine where you where you are most vulnerable. Using the Survey Roles and Facility Type filtering within the questions, you will be able to ensure that personnel only receive survey questions that are relevant to them and they are qualified to answer. You can also customize the response types for each question. Standard responses include, yes/no, 1-10, control maturity level, text, file upload, and diary/journal response. Add your own custom forms and multiple choice response types. Use the Control Standard field to give the survey respondent more clarity as to why the question is being asked, or give additional information about the regulation/standard/policy that the question refers to. RiskWatch products are a hosted solution on the web. The main objective of these tools are to save time and energy utilizing the power of internet to consolidate data from all the departments or resources working from different locations of the globe. RiskWatch products are typically hosted on RiskWatch’s secure servers. They may also be hosted on your organization’s intranet infrastructure. For information regarding self-hosting RiskWatch products, contact RiskWatch support. If hosted in an intranet, they need access to an exchange server or an email server to send email notifications to their users. See below for additional client computer and host server system requirements. Data between the customer’s browser and our server is encrypted using AES 256bit encryption. All information contained in the database has AES-256 encryption and PBE with MD5 & Triple DES, to which RiskWatch International controls the encryption key.This database is also backed up daily and sent to an offsite location in Amazon S3 where it is re-encrypted and stored for Disaster Recovery and Business Continuity. Access to the software is password protected. You can configure password complexity requirements, expiration, max number of failed login attempts, and session length.